Few years ago , months before TF:Age Of Extinction came out, the (then) new look of Optimus Prime was leaked. 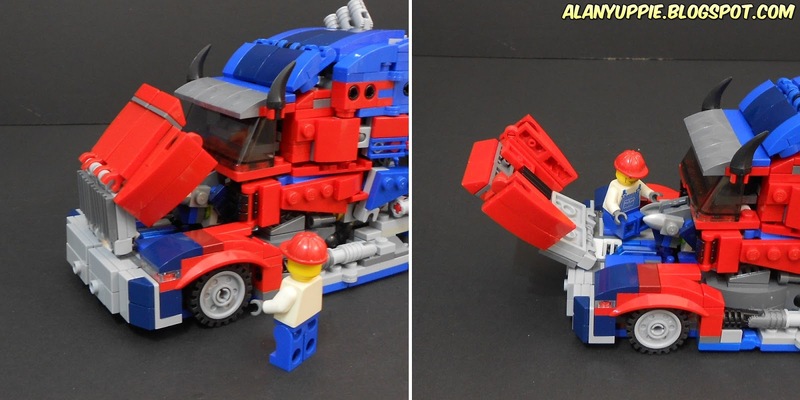 I hastily made a bricklink order to get some specialized parts in hope to build him before TF:AOE premiered. I failed to get started due to time and creative constraint (builder's block?). 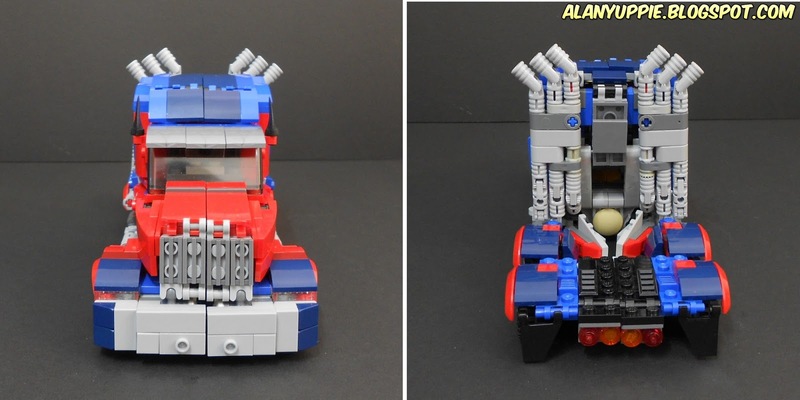 The streamlined new Prime was too much for my brain to fathom (where did the tyres and kibbles go?). Well, they did improved the toy in some ways but the chunky kibble is still there, obscured by smart angle/camera tricks. 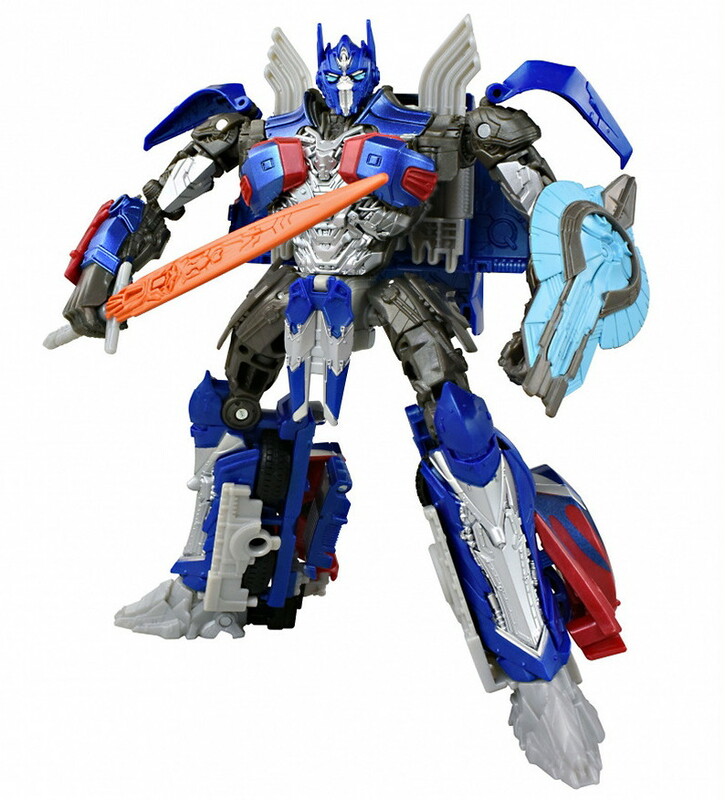 So I set myself with one aim... making a TLK Prime with better aesthetics and minimizing the kibbles on his back as much as possible. Project TLK has the honor of being updated the most times in my FB page (link below), so if you wish to know more about "the making of..." this project (and my past and future ones) , please head there and give me a Like! Thanks! One of the hardest design challenge to tackle are those smokestacks! 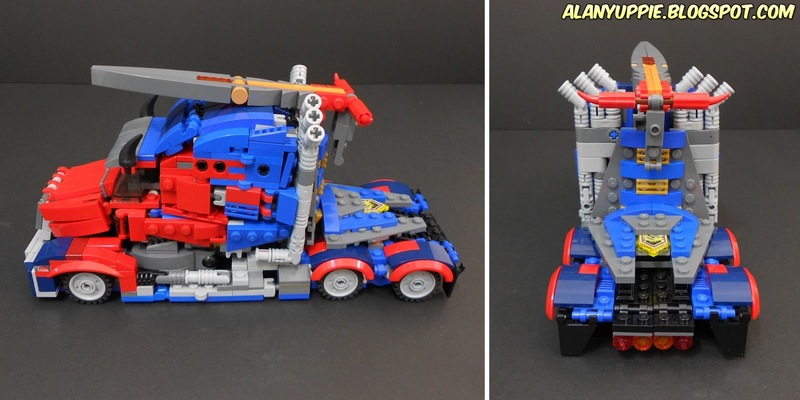 Attempts to shift them to the back of the robot mode took me many many days of trial and error. The black panels on the truck rear were pretty tricky to handle as well . Took me many days to ensure they flow nicely to form the robot mode legs. 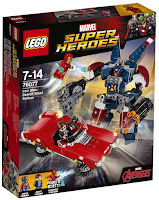 The red fenders in 4's are courtesy from a vehicle in this year's LEGO Marvel Set, which I bought it loose from ebay. 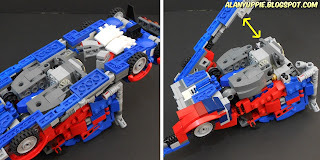 Initially I intend to use dark blue parts but due to some of the hinges not available in such color, I end up applying classic blue into my MOC. 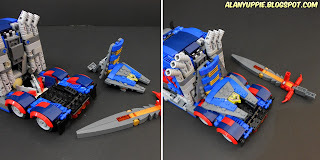 The shield and sword below were the last components to be built few days ago, and the initial design were pretty overwhelming.. in size and also in the outlook. 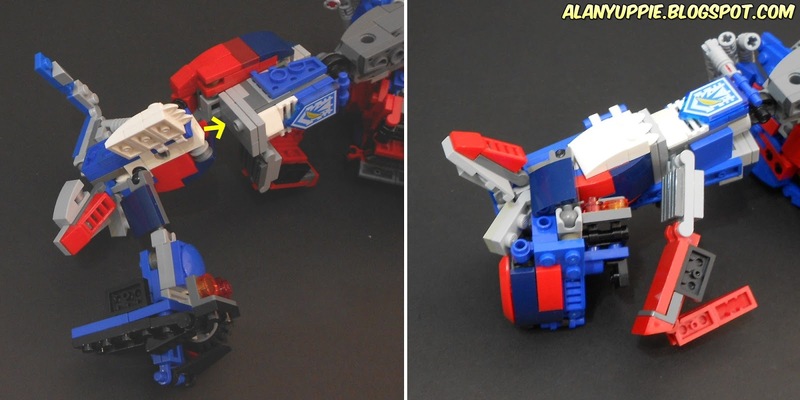 But the shield failed the "wield test": the mixel balljoint for the robot mode's elbow can't cope with such a heavy shield. So I'm forced to simplify and making them lightweight to become what you see below. What a close call! Just yesterday I bumped into photos of Prime with the shield on the back of his body. That was incredibly cool! The same night I redesigned the shield handle to cater for this feature as well. 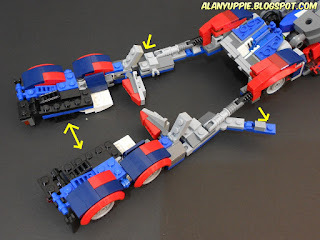 The shield has a pair of hinges to be folded into L-shape, and there is a technic axle peg on it allow the sword to be connected as well. With Bumblebee. The scale is a bit off here.. The Camaro should be a bit over half the length of Prime's Western Star truck. Now it's about 70% of the truck's length. 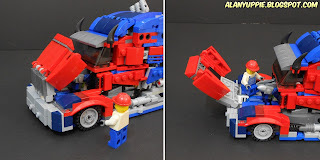 Side by side with my LEGO Powermaster Optimus Prime cab I made few years ago. 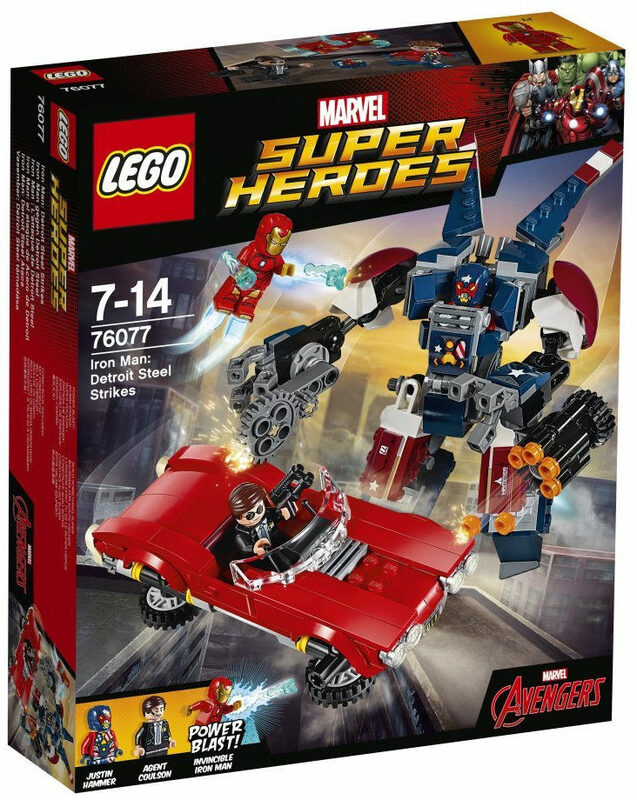 The minifig looks kinda huge next to the truck. He's probably 8 feet tall. 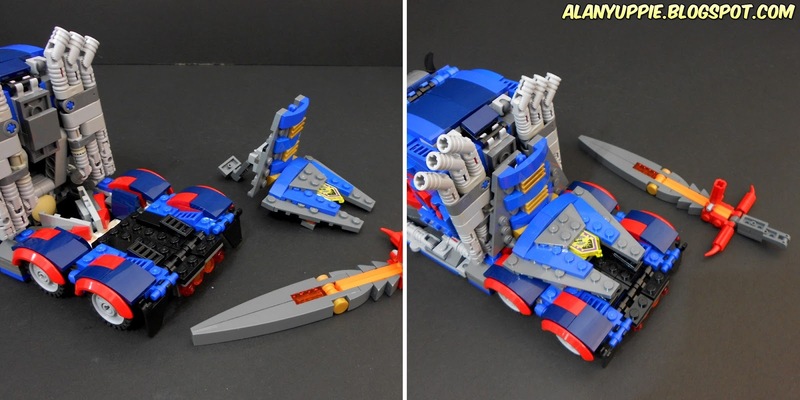 The cab front opening is part of the transformation sequence. Unlatch the truck rear from truck body (yellow arrow) . 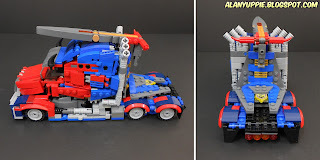 These connections ensure structural stability in truck mode between 3 major connecting components: Left leg, right left and the rest of the body. More arrows showing components to let loose. 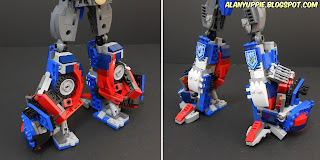 There are many ways for the legs to form. It's a matter of how I fold the hinged panels around it to make for the most appealing aesthetics. 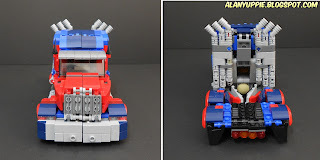 But one important criteria is that I must conceal the truck tyres as much as possible inside the legs. The back of the cab folded out to become buttflaps. 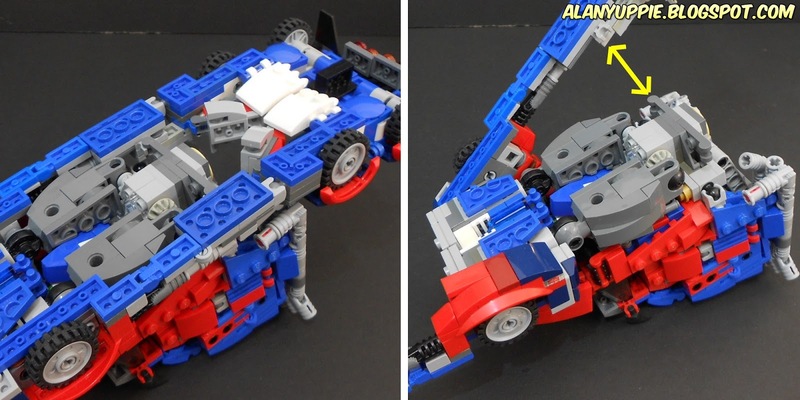 More flaps folded out from the side too, giving clearance for the arms to reveal themselves. Looks great! Thanks for the detailed write up about the building process. Can't wait to see what it looks like in full transformation!